When it comes to handset manufacturing, Samsung is leading Apple with 26.9% of mobile subscribers, but Apple’s popularity increased to 18.5% and is growing slightly faster than Samsung’s over the three month span of August to November. Apple managed to overtake LG as the second most popular mobile OEM according to comScore, while Motorola and HTC also lost marketshare. 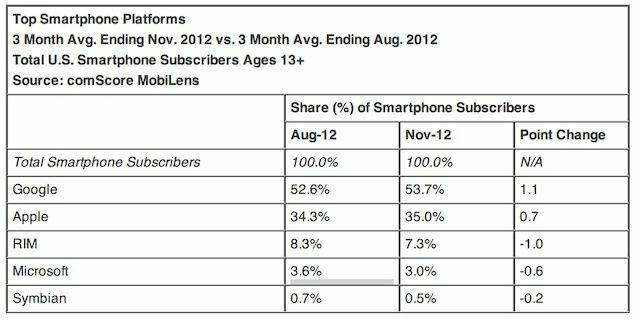 An estimated 123.3 million people in the U.S. (53%) own smartphones, which is up 6% since August. Even though Microsoft released Windows Phone 8 on Nokia branded smartphones, their share of the smartphone subscriber market actually dropped 0.6% in November while RIM has continued its downward spiral as well. Right now the smartphone wars are nothing but a two man race to the finish with everyone else fighting for scraps.